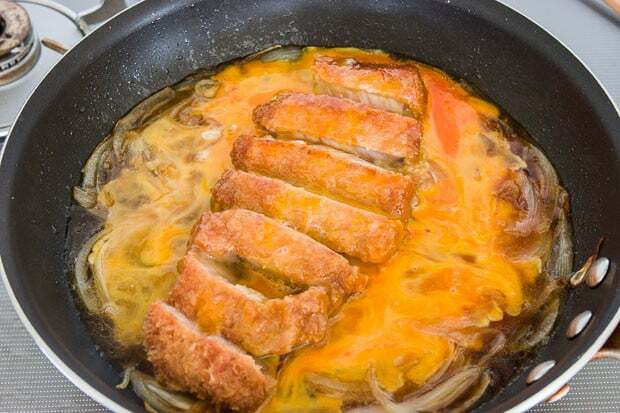 Katsudon, made with leftover tonkatsu (pork cutlet), eggs, sauteed onions and a sweet and savory sauce over a bowl of rice is a perenial favorite in Japan. When I’m at home though, I’m all about simple, nourishing meals that titillate the tastebuds without much effort in the kitchen. This explains why I’m such a sucker for donburi. What’s a donburi you ask? Literally, a donburi is a large ceramic bowl, the kind of vessel you might serve a bowl of noodle soup in. But it’s also the name of a rice dish that’s served in its eponymous tableware. If you imagine a meat dish, a vegetable stir-fry and an omelette colliding over a bowl of rice into a delicious mess, and you’ll have a pretty good idea of what most donburis are all about. Although they can be made with any meat, seafood or vegetable, one of my favorites is katsudon. The “katsu” is short for tonkatsu and “don” (pronounced like “don’t” without the “t”) is an abbreviation for donburi. It’s a popular lunchtime meal in Japan and the best part is that it can be made with leftover tonkatsu from the night before. 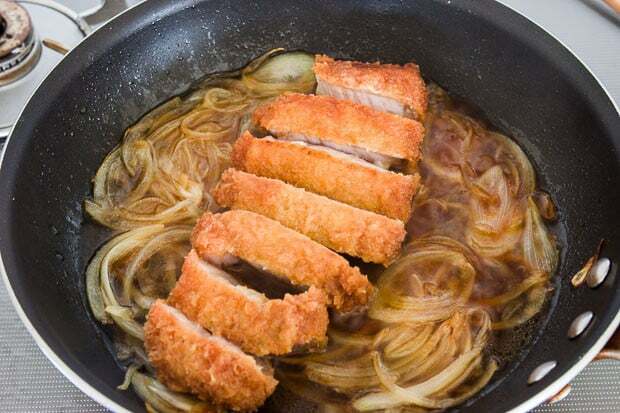 The panko coating on the pork cutlets absorb the sweet and savory sauce while sautéed onions add big flavor to the dish. The egg not only binds everything together, it also absorbs the flavors in the sauce before percolating them into the rice below. 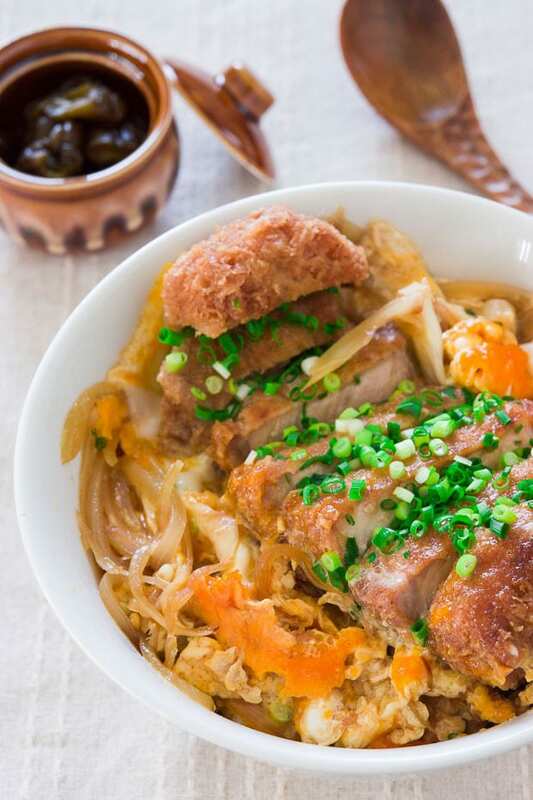 Eaten together, katsudon is luscious, meaty, savory and sweet and has the remarkable ability to satisfy a handful of cravings in one bite. Like any comfort food, I don’t stray too far from the standard preparation but I do employ a few small tricks to make the standard katsudon even better. The first thing is to add a bit of potato starch to the sauce, it lends a barely perceptible viscosity that helps the sauce cling to the tonkatsu and rice rather than running straight to the bottom of the bowl. The second thing is to flip the tonkatsu after you add the sauce. This ensures the tonkatsu is well seasoned both top and bottom. Lastly, I usually cook the egg until it’s just a bit less done than I want it to be as it will continue to cook as you assemble the rice bowl and carry it to the table. 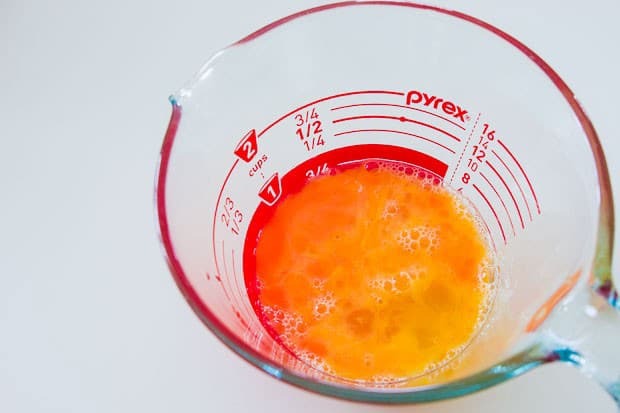 Break the eggs into a bowl and mix until the yolks are broken, but there are still separate areas of white and yolk. Add the dashi, sugar, soy sauce sake and potato starch to a bowl and stir to combine. 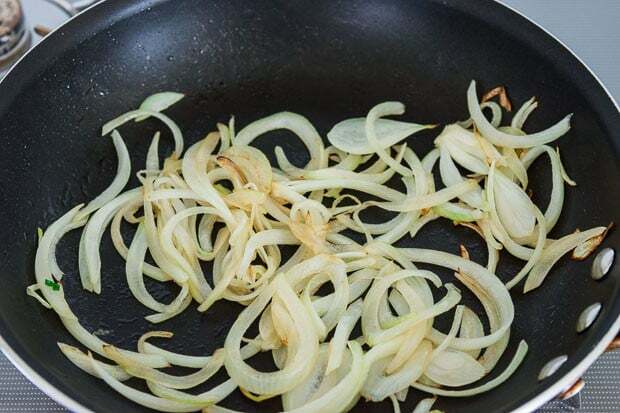 Add the oil and onions to a non-stick frying pan over medium high heat and saute the onions until soft and just starting to brown. Push the onions to the edge of the pan and add the tonkatsu in the center. Pour the sauce around the cutlet and cover for 1 minute to let the sauce thicken and the katsu reheat. Remove the lid and flip the katsu over using a spatula. This ensures the katsu is well seasoned on both the top and bottom. Pour the egg all over and around the katsu and sprinkle on the green onions. Cover and steam until the egg is just a little less cooked than you want. Personally I like my egg creamy, so I let it steam until the egg is set on the bottom but still a little runny on top. By the time it gets to the table, the residual heat cooks it to a creamy custard texture. Put the hot rice into bowls and cover with the tonkatsu and egg mixture, drizzling any remaining sauce on top. This is an Asian dish I think I can actually make with some confidence. It’s approachable. Good luck finding clothes. Food shopping is much easier for me than clothing shopping. BTW, I am finally at wordpress using the thesis theme. It’s so easy and life changing for me. Thanks for offering to help, but we had no glitches, thankfully. Welcome to Tokyo – I have been following your recipes since I recently found a recipe for a ippudo-style tonkotsu ramen, just wish I had some trotters now! Your pictures are great too, I’ve just taken up photography… Let us know if you need any company on your food-adventures here !! Try a restaurant called Katsukura in the Takashimaya Times Square building near Shinjuku Station! I commented in more detail on your tonkatsu recipe accompanying this one. Continue to love your blog and your photos! Enjoy your trip! Lately this has become my favorite dish! I only recently discovered, with not many Japanese restaurants serving it in Vancouver. The combination of the ingredients is phenomenal – real comfort food to me. Thanks for the recipe and for sharing your amazing pictures. Marc: my family loves your recipes. Thank you for helping me cook healthy and traditional food for my half Japanese sons! I feel it is important in many ways to keep them in tune with their heritage plus it is better for them than macaroni and cheese. I have made about all your Japanese recipes that are kid friendly. I can’t wait to see more (hint hint)! Thank you again!! Thank you for the recipe I lived in Japan for three and a half years and Katsudon was my favorite dish. Love love love this! Thank you for your background and commentary on the dish. It adds so much more than a traditional recipe. Great pictures, excellent writing, clean and easy to read. Someone to aspire to… Cant wait to make this. I just made this, thanks to your recipes (I used your tonkatsu recipe, too). I have to thank you. This is the greatest thing I have ever put in my mouth. Thank you. Thank you so much for the recipe! Im gonna cook this one later. It’s hard to say without knowing where you live, but if you’re based in the US, there are two online Japanese grocery stores. Marukai ( http://www.marukaiestore.com/p-7105-kaneshichi-mutenka-katsuo-jyun-dashi-085oz.aspx) and Mitsuwa (http://shop.mitsuwa.com/eng/egoods/edetail.php?pid=3020) both of which sell additive-free dashi packs, which is what I’d recommend as many of the dashi granules have MSG and other unnecessary additives. May I asked what you replaced dashi with? Yes you need to dilute it according to the package directions. Dashi is soup stock. You have dashinomoto which means “base for dashi”. Dashi is Japanese stock. It would be like replacing the chicken stock in gravy with water. You’ll still get salt from the soysauce, but you’ll lose most of the flavor. Go on Amazon.com and you can find dashinomoto. I always get the bigger boxes there because I use it so much. Chicken stock or water would work, but it’s the dashi that gives it the Japanese taste. Diulted tsuyu can be used but always watch your sodium consumption. Hi Nathan, I’m not sure what miso pork is, but maybe “miso pork rice bowl”? If you’re looking for a Japanese name, that would translate to: “miso buta don”. what is the measurement for water and ginger? i also ddnt have dashi. Sure, just add it in with the dash. If you use mirin you’ll want to reduce the amount of sugar in the sauce. Hi Katrina, I typically use Kikkoman or Yamasa, but any Japanese soy sauce should work. It’s not that there’s anything wrong with other countries soy sauces but there are a lot of variations in concentration and sweetness. Japanese soy sauce tends to be lighter than a lot of other Asian soy sauce. I know. The best I can do is bacon and eggs. Been doing it for a while but also been meaning to look up what sort of cheese or veggies to add to the omelet to give it a bit of extra zing. I don’t suppose you have any suggestions or recipes I can look at. It has to be at the beginner level, though. I figure if I can master that, I could progress to more complicated things. Hi Gary, this is one of my favorite omelettes, and it’s easy to do because it doesn’t involve stuffing a thin layer of egg with something: http://www.pbs.org/food/fresh-tastes/masala-omelette/ As for cheeses, any melting cheese works good, personally I love gruyere or comte in an omelette, but if you prefer something milder, cheddar or fontina would work. Thanks. I wasn’t sure what kind of cheese would work. But I’ll pick up some cheddar the next time I go shopping and try it. I was thinking of adding something like shallots to the omelet but I’d been meaning to look up Spanish omelet or Western omelet. Basically, something simple that a beginner like me couldn’t mess up too badly. I’ve been meaning to tell you, I found a very nice local smoked cheddar and am using it in my omelets with great success. Thank you for the advice, Marc. Sounds good, glad to hear you’re found something that works for you! What brand of sake would you recommend I use for this recipe? Hi Anissa, there are literally thousands of brands of sake, and many of them will work just fine. My policy for alcohol used for cooking is that it doesn’t have to be expensive since most of the finer nuances of expensive sake/wine/etc will evaporate during cooking, but you never want to use something you wouldn’t drink (i.e. with off tastes, or “cooking” sake that has salt added to it). Hi Marc ^^ I was wondering if you perhaps have a reccomended recepie to go along with the cutlet bowl? Hi Jojo, Katsudon is usually a 1 bowl meal as it has veggies, meat, eggs and starch all in the same bowl. The only thing it’s usually served with is miso soup and pickles.